SHARMINI PERIES, EXEC. PRODUCER, TRNN: Welcome back. I’m speaking with Economists for Rational Economic Policies. A recently titled report in the UK titled The Cracks Begin to Show: A Review of the UK Economy in 2015. 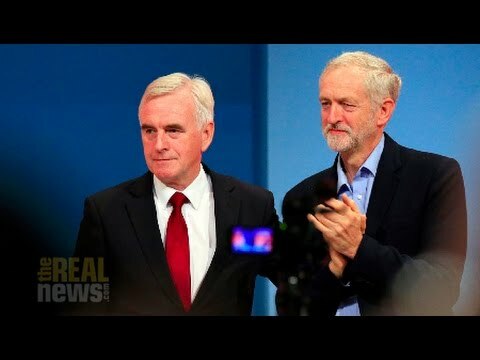 In the first segment we dealt with some of the findings of the report, and in this segment we’re going to discuss the credibility of the Labour Party and their capacity with their newly-minted leader, Jeremy Corbyn, to present a different kind of economic agenda for the UK. For that I’m speaking with three contributors to the report, and they’re joining us from London. First we have John Weeks. John Weeks is a Professor Emeritus at SOAS, at the University of London. Then we have Ozlem Onaran. She’s professor of economics at the University of Greenwich. And we have Jeremy Smith. He’s currently co-director of Prime Economics, a policy research house in macroeconomics. Thank you all for joining us. JOHN WEEKS: Thank you for having us. PERIES: All right. John, let me go to you first on this. And let’s begin with why you have greater confidence in the Labour Party in terms of presenting a better economic plan, agenda, for the UK. WEEKS: First I must stress that our group is not affiliated with the Labour Party. Our report does not endorse the Labour Party. It looks at the British economy. But nonetheless, [inaud.] should be interpreted as showing [inaud.] considerably more credible on economic policy than the current government. I’ll briefly explain why. To understand the context, the American watchers should realize that the election of Jeremy Corbyn as head of the Labour Party would be rather like the Democratic party nominating Bernie Sanders to run for president. There would be that much of a dramatic break. There has been that much of a dramatic break. The Labour Party before the election in May took a position that most people would call, most people would call, austerity-lite. That is, there was a hesitancy, some people would say a fear, of breaking with the Tory policy of budget cuts because, for fear that the Labour Party would be attacked as not understanding the economy and not being worried about deficits. Jeremy Corbyn has come in and he has picked a chancellor, that’s a person who is in charge of economic policy, with an absolutely clear policy: the Labour Party is now against budget cuts. Cuts are necessary, on the contrary, the government needs to spend, the government needs to spend more to expand the economy and generate productive employment. And John McDonnell has developed a fairly clear and detailed plan that emphasizes public investment in infrastructure, and basic things such as high-speed internet access, and such as that. So I think that the Labour Party is now credible and impressive on economic policies. I mean, nobody’s perfect. But there’s such an improvement upon the past that they look awfully, awfully good. As a result, of course, of a dramatic change, a basic change that was brought about from the grassroots, I should add. Jeremy Corbyn won over 60 percent of–someone, one of my colleagues may correct me, it may have been more than that–of the Labour Party membership. Maybe up towards 70 percent. And the Labour Party is of course filled also with supporters of Tony Blair, and out of that ideological period. And so there is a very deep split within the party. And the new leadership faces a very difficult time imposing its policies as the united front of the opposition. And I think some progress has been made in that regard, but we can’t kid ourselves. The right-wing elements within the Labour Party are attacking Jeremy Corbyn, and attacking him precisely for the policies I just described. PERIES: Ozlem, you argue in the report that the rise in inequality and stagnation in wages is among one of the fundamental flaws in our current economic model, pursued by David Cameron and group. Why do you think that the Labour Party, if you do, can address this imbalance more adequately? OZLEM ONARAN: Well, the rise in inequality and the falling share of wages is not something that comes with technological change or things that are out of our control. They are made up by policy of the previous governments. Now, this current Labour government understands this. And one of the most important policies to reverse that is to give more power, bargaining power, to working peoples’ organizations again. This government is trying exactly the opposite. They’re trying to [inaud.] what is remaining from trade unions. They’re trying to complete what Thatcher has started. They’re trying to finish the trade unions in this country. In the debates about new trade union bill that the government wants to introduce, the Labour Party MPs very credibly understood and stood against this bill. We have recently launched new research showing the impact of falling trade union power on the wage share, and several of the Labour MPs have explicitly referred to this report. For example, if we could go back to 1980s when union power, trade union power was at its peak, when half of the people were a member of a union, that would actually reverse the fall in the labor [share] almost completely, according to our recent estimations. And it would increase growth. It would give about 400 pounds more annual income to each person in this country. And the Labour MPs understand this. The other thing that is for me very credible, is that the Labour Party understands that income policy [should] part of macroeconomic policymaking and has to be part of a broader industrial policy. As John was referring, John McDonnell has a very clear understanding of the need for industrial policy. And industrial policy includes policies about industrial issues on the one hand, and also policies about corporate governance on the other hand. As I was referring to in our previous conversation, financialization, the shareholder value orientation of non-financial corporations, increased distributions of dividends to shareholders, as well as increased involvement of corporations in financial speculation, has created one of the major setbacks to private investment and productivity in this country. John McDonnell explicitly understands that we have to change the rules of the game in terms of corporate governance. What the corporations are allowed to do with their profits and what they’re not allowed to do with their profits. And of course this is an attempt to on the one hand improve the profit and [inaud.] nexus, to reverse the negative impact of financialization on private investment, which we very strongly find in the recent research to go with [inaud.] when we look at the British corporations. On the other hand, they also understand the need to reverse the deterioration of industrial relations and give more voice to working people at their workplaces. I think a culmination of that offers great promises to reverse the [flows] and the shaky foundations of growth in this country. PERIES: And Jeremy, what do you think of what Ozlem is saying, and how does labor productivity contribute to stimulating the economy in a different way? JEREMY SMITH: Yes, the, I suppose received wisdom these days is that productivity is driven mainly by supply-side measures, by things you do to liberalize or flexibilize your workforce, i.e. give the employees more power, but also longer-term necessary things like training and education. And of course good education and training is essential. But in the short term what I’ve tried to show in this report is that productivity actually is a function of demand in the economy much more than anything else. So in the short to medium-term it’s demand that will drive improvements in productivity overall. Now, that leads to the consequence that when you have a very flexible low pay, with real cuts in pay, the incentive for employers is to employ people on very low pay as against to invest, and so on. So this is very important. Now, the Labour Party is shifting to, as John and I think Ozlem have both said, to a much stronger focus on public investment. Private investment has grown a little bit in recent years, but public investment has fallen back. And it’s public investment that can drive in particular higher–not only helping to build the economy we need for the future, both in terms of digital economy but also the transition away from a carbon-dominated economy. So there’s a huge amount of work to do. And that tends to be higher-paid, more trade unionized, and therefore much more likely to create the improvements in productivity at the same time. So I agree with my colleagues. But this is a terribly difficult thing to get across to the great public, who still have had years and years they’ve been told that any kind of deficit, you know, is a disaster. Whereas actually we’ve seen the precise opposite. So somehow we’ve got about four years to, both for the Labour Party to get its act together and to start showing a bit more internal solidarity, and secondly to get across this message to the British people that the true economics that if pay increases, if investment increases, we will all be better off and most of the deficit will disappear along the way at the same time. But it’s still a very tough sell, because the main media outlets are so stuck in the model that, you know, you must cut public services in order to cut the deficit. Which, as John has said, just has not worked and does not work. PERIES: Now John, demand seems to be a very important factor, and you argue that currently the UK economy is demand-constrained. How do you grow demand? WEEKS: [Inaud.] step. I would say that, [inaud.] I started to say the only step. I do [inaud.] is for the British government to increase expenditure. That is yes, temporarily increase the deficit. And that is because the net effect [inaud.] negative in terms of [growth]. PERIES: Okay. John, hold on for a second. Yeah, apparently your sound is dropping, so let’s try again. Give me a countdown first. John, you argue that the UA–UK–sorry. Let me try again. John, you argue that the UK economy remains demand-constrained. What does that mean, and how do you grow the economy? WEEKS: An economy is demand-constrained when the amount the private sector can produce is limited by how much they can sell. Now, that may seem a very simple concept. But the neoclassical, the right-wing economists, don’t accept that. They do not think that economies are demand-constrained. Now, why is the British economy demand-constrained. It is because after the collapse, just as in the United States, the collapse in 2008-2009. After that you had you had a huge buildup of private debt, and you had a financialization of that debt. And as a result of that, the incentive of private companies to invest is very low. As Jeremy said, there has been some recovery in that, but it is not close to being enough to stimulate the economy, to generate well-paying jobs and expand at a, even a moderate pace. Also, I would like to finish on this by pointing out a real, a very strange thing about the British economy. I think also to a lesser [extent] the U.S. economy. We normally think of economies as producing things and then distributing them, transporting them, selling them. And you are able–companies are able to do that because they can borrow funds for working capital and to invest. So we normally think of finance as being something which facilitates production and distribution. In the British economy over the last five years, since the Tories have been in power, finance is the only sector of the economy which has grown substantially. The entire recovery of the British economy has been in the financial sector and financial–financially related sectors, such as insurance and business services. Now, you have to ask, what are those finances doing if there’s less stuff being transported, if manufacturing production’s at a lower level, if there’s less electricity generated, et cetera, et cetera. What are they financing? Speculation. That’s what they’re financing. And that’s what we have to stop. And here I would say John McDonnell has been quite clear. He would very strictly regulate the financial sector. And in that sense he has a lot in common with your outstanding senator from Massachusetts, Elizabeth Warren. It seems to me that is essential to the economy recovering and stimulating demand in the long run. PERIES: Ozlem, let me give you the final word here. Now, obviously with Labour re-emerging as a force with the leadership of Jeremy Corbyn, it could do some very positive things in the next little while to stimulate the economy, represent Labour. Give us some of the steps that could be taken immediately, as they are obviously the opposition at this time. ONARAN: They have been very effective in making Osborne take a fundamental step backwards in stopping the cuts to working peoples’ [inaud.] credits. So it has been one example of an effective opposition, what a united effective left opposition can achieve. Obviously the debate around the trade union bill was very important, because if trade unions lose further power. There’s no way of reversing inequality. In that sense I think Labour put the pressure–the bill has not become legislation at the moment. It will have one last reading and discussion at the House of Lords. So this battle hasn’t been lost yet. Well, I’m afraid it hasn’t been as strong of an opposition as the case for the tax credits was, where some of the big [ventures] of the Conservative Party was also [inaud.] because of the unpopularity of those cuts. Now, with regards to more transparency and more regulation in the city, and again there is at least a very credible opposition, but I would like to see a much more united, concerted effort with regards to that. So we are still far away from making the financial sector, the city, accountable for all the corruption and all the frauds of the past. And we are far from, of course, a step towards regulating it. I think what can be done in opposition has its limits with the strong Tory majority in the party at the moment. The importance is, to become an effectual position, is to work with the anti-austerity movements, work with peoples’ assemblies up and down the country, organize an effective opposition not just in the parliament but also in the society, so that this can then become the wind behind a new Labour movement that hopefully can win the elections in 2020. PERIES: Ozlem Onaran, and of course John Weeks and Jeremy Smith, I thank you all for joining us today, and we hope to have you back very soon. ONARAN: Thanks for having us. WEEKS: Thank you for having us. PERIES: Let me try that again, okay? Hold on, our outro didn’t work out quite well. I’m going to try again. Ozlem Onaran, John Weeks, and Jeremy Smith, I thank you all for joining us. PERIES: And we hope to have you back very soon, and follow the developments in the UK, and I hope you joining us on the Real News Network. Ending Inequality!? What Does Real Equality Look Like?